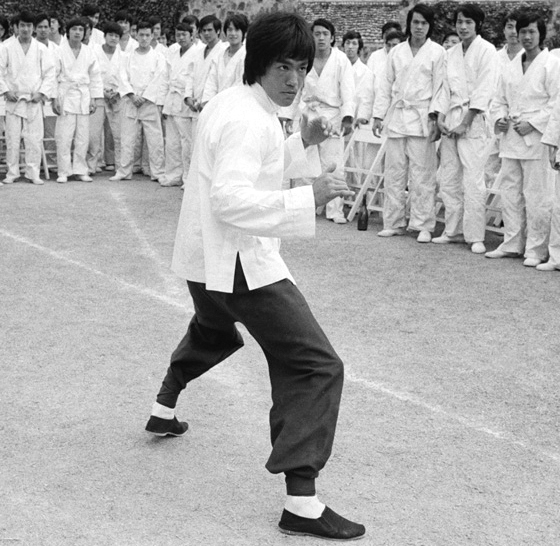 The “On Guard” position is what Bruce Lee called his resting stance in JKD. This is the optimal stance from which movement can initiate. The On Guard stance can be used as a metaphor for having the proper stance and orientation in life. With this stance you are poised to initiate movement in your life. Bruce believed that this position was the most favorable for the execution of action. What is the stance for you that gives you a feeling of centeredness, knowingness, and confidence, that would allow you to move through your life with the most ease and power? The way that we stand and move about physically in this world projects and broadcasts our ideas and spiritual mindsets. Our body is an expression of our spirit. What would it take for you to be organized in your mind and your body so that you can move through your life most easily? It takes a lot of self-work, self-discovery, and practice to understand what your effective ready position is and how you operate best. It does not matter how well polished your performance is on the outside, if you are not in harmony and balance with the spirit inside then you will become depleted and break down. It takes a lot of effort to keep up a performance. What is your foundation? Where is your set point from where you start and stop? You can start by examining how you begin and end your days. It is impossible to always be in a state of neutrality in whatever we encounter in life, there will be times where circumstances knock us out of our neutral zone or we are required to have fast action. But it is how quickly we can return to our neutral foundation that is important, and then we can reflect on what happened with more clarity. If it takes you a long time to return to your foundation then that is important information to have about yourself.